For some shops, adding a tilt rotary table to their 3-axis machining center is an economical solution to achieve 5-axis capabilities. There are some limitations to consider. Because the tilting-rotary tables are quite large, they monopolize most of the 3-axis machining center’s work envelope. The relatively small work surface means it should only be used for small parts (12 inches or less) and should not be used for heavy cutting operations. 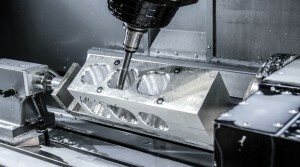 Additionally, you need to make sure the control of your 3-axis VMC is 5-axis capable.